Our Homemade Whipped Cream Recipe is the perfect compliment to almost any dessert – and you can change the flavors by switching up the extract you use! 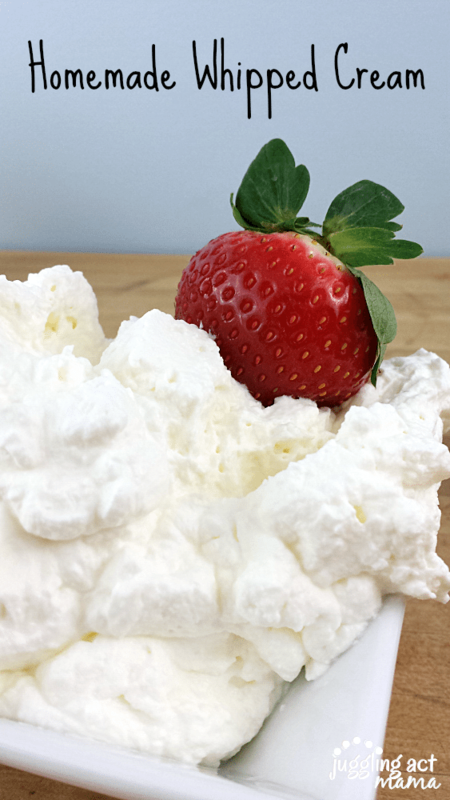 Our easy and delicious Homemade Whipped Cream Recipe is a must-have! I absolutely love making my own homemade whipped cream. It’s so thick, rich and delicious – it takes any desserts from good to fabulous with one decadent dollop! It’s so much easier than you think, especially with a good stand mixer. 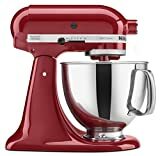 For Christmas, two of my sisters bought me this gorgeous beauty – my first ‘real’ mixer. I’m in love! 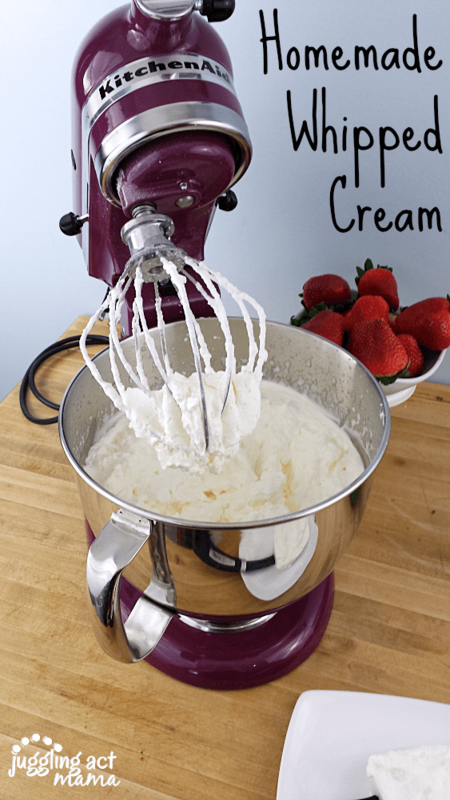 It makes homemade whipped cream in no time flat! Can you make whipped cream out of milk? In a word, no. 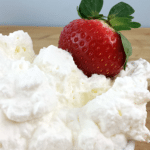 There is not enough fat content in milk to make whipped cream. Can whipped cream be made ahead of time? Yes, it can be made a few hours in advance. Once you have stiff peaks, cover the bowl with plastic wrap and set it in the fridge until ready to use. If needed, hand whisk to fluffy it back up. How long can you keep homemade whipped cream in the fridge? A homemade whipped cream recipe will last 2-3 days in the fridge, however, you will most likely need to whisk it before serving. As it sits, the whipped cream will become less fluffy. Always start by placing your bowl and whisk attachment into the freezer for 10-15 minutes to chill. Do not over beat! Stop the mixer once you have stiff peaks. This recipe is the perfect addition from morning until night! Add a dollop to your waffles, a spoonful to fresh berries for a snack, or pile it on top of a delicious pie for dessert! 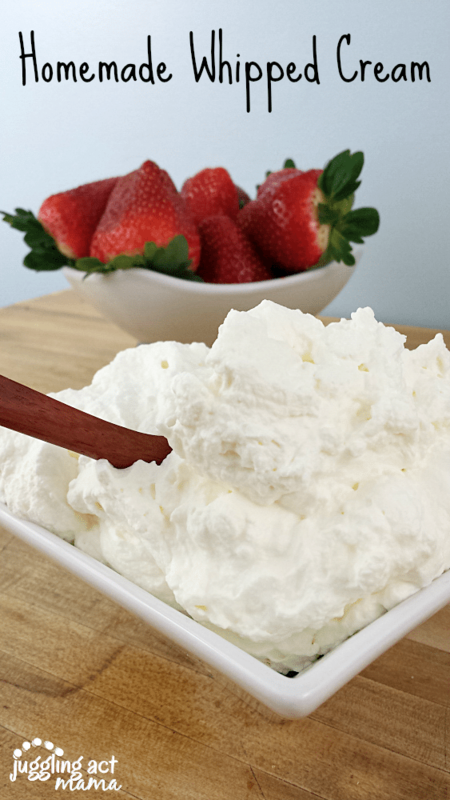 This sweet delicious homemade whipped cream is the perfect accompaniment to almost any dessert! Before you begin, put the bowl of your mixer and the beater(s) into the freezer for 10-15 minutes. Combine the sugar, cream and extract and beat on low to combine. 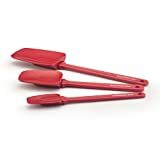 Whip together until stiff peaks form. Serve immediately. Store in the refrigerator for up to 1 week. Re-whip if necessary. 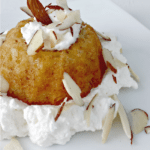 Toasted Coconut Whipped Cream: add 1/2 teaspoon of coconut extract. Bake 1 cup coconut at 350-degrees for about 10 minutes until toasted. Fold into the finished whipped cream. Orange Whipped Cream: add 1/2 teaspoon orange extract, plus the zest from 1 orange. Add a couple drops of orange food coloring. Need an idea on how to use this delicious whipped cream? 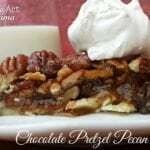 Inspired by a famous magazine, myChocolate Pretzel Pecan Pie is a really fun twist on the classic pecan pie. Mini Almond Bundt Cakes are perfect for celebrations anytime of year, and especially tasty with fresh berries. Who says you can’t have whipped cream for breakfast? 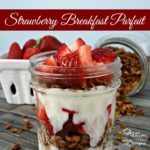 Try this Strawberry Breakfast Parfait! Still looking for more? Here are some recipes from a few other awesome bloggers!